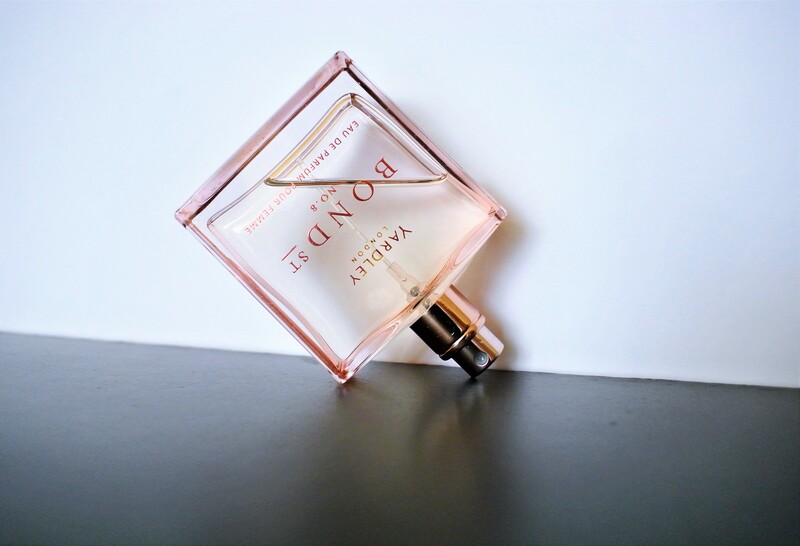 About six months ago I posted about why men should wear female fragrances, in particular floral fragrances. You can read that post here: http://fragroom.com/2017/06/12/men-should-wear-womens-fragrances. 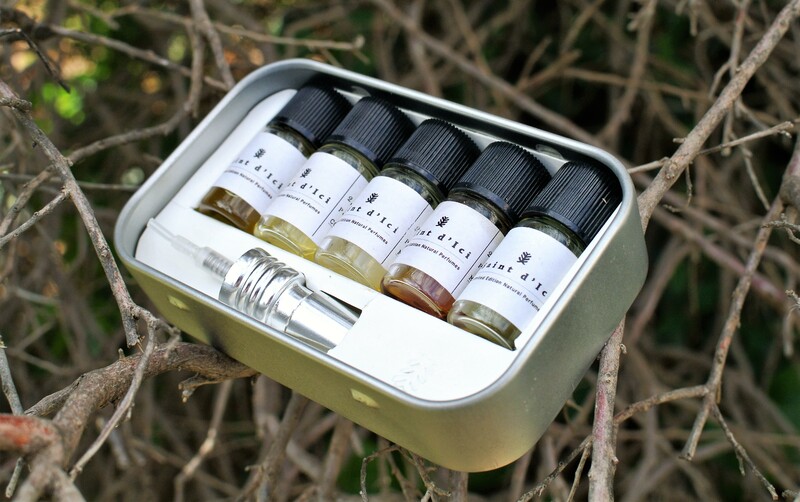 After all, why miss out on so many more options by limiting oneself to so-called masculine fragrances? Since then I’ve been sniffing out some new floral fragrances. While officially female floral fragrances, brave boys should consider giving these a go, too. I have already shared my thoughts on this year’s mega-launch, the much-debated Gabrielle Chanel EDP (http://fragroom.com/2017/09/19/gabrielle-chanel-fragrance-review/). In brief, although it’s not particularly ground-breaking, it’s a good option if you are looking for a well-executed and elegant white floral. Here are my thoughts on some of this year’s other floral fragrances, which range from the fresh to the full on. Elizabeth Arden has a reputation for producing worthwhile budget fragrances and Green Tea Mimosa is another goodie. Green tea and citrus notes open this EDT, with mimosa then coming to the fore. There are also splashes of osmanthus, orris root, heliotrope and ambrette seed here. It nails summer freshness oh so well. And because it’s not over-powering, it’s the perfect intro to floral fragrances if you’re still not quite ready to go the full-on florals route. Elizabeth Arden Green Tea Mimosa EDT, R425 for 100ml. Phew! Never mind full on – this is a super-intense white floral fragrance. It’s a collaboration between master perfumer Alberto Morillas and Gucci creative director Alessandro Michele. This EDP features natural tuberose absolute, natural jasmine absolute, jasmine bud extract and Rangoon creeper (apparently the first time it has been used in a fragrance). Gucci Bloom is like being in a hothouse – wonderfully intoxicating or get-me-out-of-here suffocating, depending on your mood. Gucci Bloom EDP, R975 for 30ml, R1 335 for 50ml and R1 710 for 75ml. There’s no floral fireworks to be found in Yardley Bond St No 8. What you will find, though, is a slightly sweetish take on the genre, featuring notes of neroli, orange flower, white rose petals and musk. It fades quite quickly. But for the price, it’s a good enough cheapie. Yardley Bond St No 8 EDP, R399.95 for 50ml. The latest addition to the Zadig & Voltaire fragrance range features patchouli, vanilla, white jasmine absolute, tuberose absolute and woody notes. It’s a smooth, soft and creamy floriental, without the in-your-face associations of the genre. It comes in a striking sculptural bottle, designed to fit its male counterpart. I will review Zadig & Voltaire Just Rock! For Him in an upcoming post. Zadig & Voltaire Just Rock! For Her EDP, R785 for 30ml, R1 100 for 50ml and R1 460 for 100ml. Just because I am a fragrance and grooming blogger, don’t assume I get everything right. In fact, I am frequently astonished by how many grooming mistakes I make. Some of these grooming mistakes I rectify the more I learn (for example, how to gently apply an eye product), but others I find myself making repeatedly. These are some of my biggest grooming mistakes below. Please tell me about some of your repeat offences. APPLY HERE: Spraying the wrists with fragrance is easy enough. I know this is a no-no, as it breaks down the top notes of a fragrance. I blame this particular habit on my nervy character. Every time I find myself doing it, I correct myself by re-applying the fragrance on my wrists, this time without rubbing, and on other pulse points. These include inside my elbows, behind my knees (yes, really! ), on my neck and shoulders. By spraying fragrance on these warmer areas of my body, it activates and intensifies the fragrance. X MARKS THE SPOT: Stop that wrist action! Right now! I started balding in my late 20s and accepted this genetic reality long time ago. My hair stylist does a great job with my limited hair resources. But when left to my own devices, I frequently wash my hair with soap. I know, typing out that sentence, I cringed too. So I have decided to, at least, wash and condition my hair with a decent product. GENETIC INHERITANCE: I accepted certain realities a long time ago. I’ve recently started using Marc Anthony Men Stuff Thickening Shampoo + Conditioner With Bamboo, R139.95 for 380ml. I don’t expect much in terms of hair thickening at this very advanced stage of balding. But I am enjoying how this sulphate-free, nutrient-rich haircare product gives my hair and scalp a regular dose of TLC. I have been going on about this a lot recently. But that’s because I have learned the hard way how it causes unnecessary ageing and pigmentation. And did I mention the risk of skin cancer? 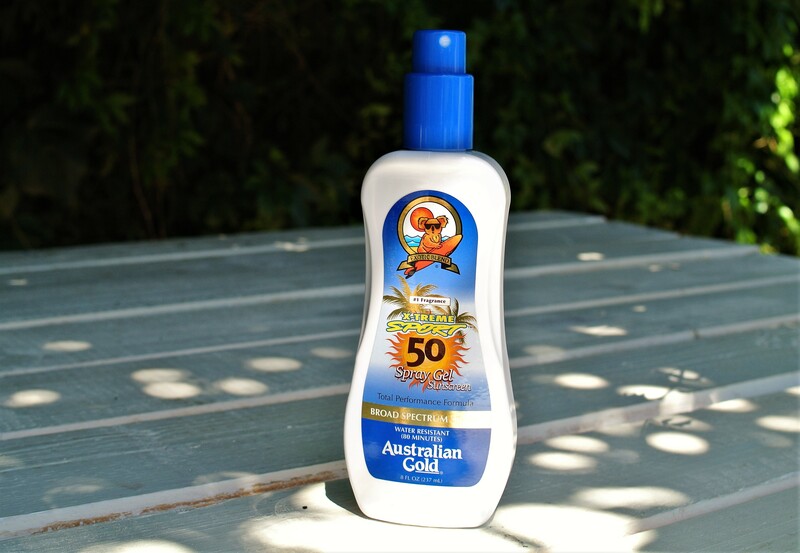 I’m no sun ‘n sports bunny, but Australian Gold X-Treme Sport 50 Spray Gel Sunscreen gets the thumbs up for containing the vitamin C-rich kakadu plum (free radicals protectant), the antioxidant tea tree oil (cleanses the skin), moisturising sunflower seed and olive fruit oils and soothing aloe vera. I like how after I have sprayed this gel on my hands and spread it on my face, it’s easily absorbed. Plus plus, it doesn’t leave a thick, greasy film and smells pretty good. ON THE PAPER TRAIL: Nothing wrong with a bit of thinking inside the box. Soaking my feet in warm water to soften the skin. Vigorously using a pumice stone to remove the offensive skin. (Tip: Better be patient, it might several sessions, if I’ve been a really bad boy.) I am using the Titania for Men Pumice Sponge, R24.95 from Dis-Chem, for this hard, but necessary labour. It’s cardio with a purpose. Applying good ol’ aqueous cream to moisturise my heels. Quite basic, really, come to think of it. My home town is associated with many things (not all of them positive), but it’s certainly not a centre of perfumery, natural or otherwise. So I was very intrigued to discover that Marie Aoun’s natural perfume company, Saint d’Ici, is based right here in Johannesburg, South Africa. Marie was most kind to send me a sample pack of her natural Saint d’Ici perfumes. The metal box contained five scents. These included: The Company’s Garden, Myrrha Ambrata, Nomvikeli, Une Mandarine Pour Mon Homme and Mon Coeur Noir. At first I had to adjust to the raw earthiness of Saint d’Ici fragrances. But once I had done so, I enjoyed their unpretentious, almost “dirty” character. I use the word “dirty”, because many modern fragrances are overly sanitised. LITTLE BOTTLES: Samples of Saint d’Ici Mon Coeur Noir, The Company’s Garden, Nomvikeli, Myrrha Ambrata, and Une Mandarine Pour Mon Homme. On the Saint d’Ici website, Marie explains how the name of her company came about. It also captures her approach to natural perfumery. OLFACTIVE MEMORIES: Lavender is one of the classic scents that attracted Marie Aoun to natural perfumery. I was not able to meet Marie for an actual face-to-face interview, after my initial email questions. She had just become a mother for the first time, so obviously didn’t have much free time. I hope to meet her in the future, as I would love to learn more about her craft. In the meantime, though, this is what she had to say about her love of natural perfumes, “synthetics” and working with natural ingredients. PORTRAIT OF A NATURAL PERFUMER: All pics courtesy of Marie Aoun, except images of sample pack, lavender and sample bottles. Where does your love for natural perfumery come from? Quite simply, from my love of nature. My happy place is lying down under the trees in my garden. I believe most of us find nature therapeutic – we’ve been programmed that way. Perfumes are a sensual pleasure. I find that natural perfume ingredients affect me, mentally, physically and spiritually, in ways that synthetics cannot. Why did you launch Saint d’Ici? And what do you hope to hope to achieve with Saint d’Ici? 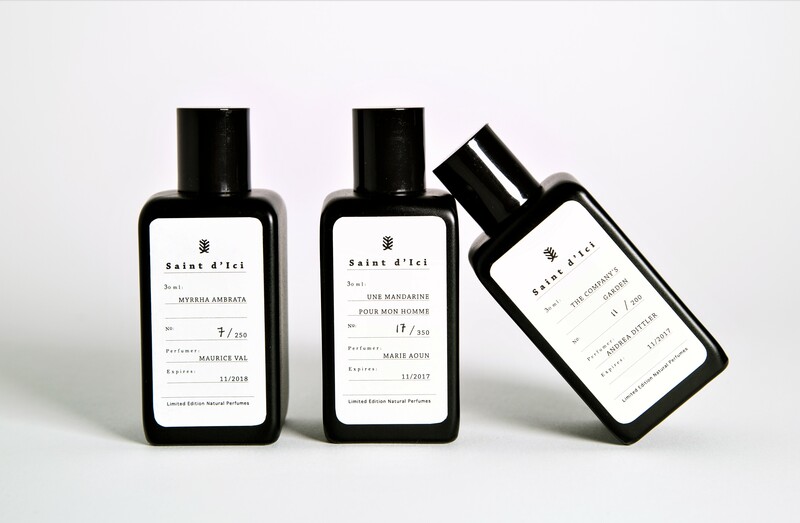 I launched Saint d’Ici to create beautiful perfumes made exclusively from natural ingredients. 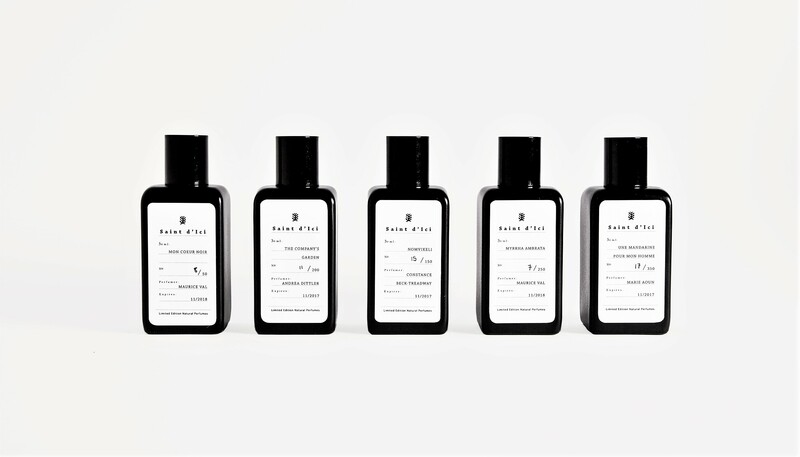 Our perfumes are limited to editions of between 50 and 350 bottles per scent. This way we honour the seasonality and variability of natural ingredients. We also source most of our ingredients directly from farmers and artisan distillers in southern Africa. This way we ensure the purity of the ingredients and the ethics behind their production. We created the hashtag #farmertofragrance to illustrate the importance that we attach to working this way. The added benefit of directly sourcing from small-scale farmers is that it provides us with access to lesser-known perfume ingredients that are only produced in small quantities. Our goal is to make all of these wonderful natural ingredients come alive through our perfumes in ways that will enchant the wearer. FARMER TO FRAGRANCE: Saint d’Ici sources most of its ingredients directly from farmers and artisan distillers in southern Africa. Are you totally against “synthetic” fragrances? I wish I could remember where I had read this so that I could give the author their due. But the gist of what they said was: choosing a branch of perfumery is like choosing a religion. You cannot claim superiority. Clearly my religion is natural perfumes, but I am happy for others to practise synthetics. Having said that, I do take olfactory offence at the proliferation and strength of synthetic smells. I literally have to hold my breath until I’ve passed the candles and diffusers in most home stores. THE OTHER HALF OF THE BLEND: African perfume ingredients. What’s your favourite natural ingredient to work with? That is a very tough question! I find that I go through phases. Lately I find myself adding a little bit of omumbiri or Namibian myrrh to most blends. I find that it helps seemingly disparate elements come together. It also lends expansiveness, modernity and masculinity to my mixes. One ingredient I never tire of smelling and working with is bergamot. Although true bergamot is from Sicily, I source mine locally from South Africa’s Western Cape province. It is just as beautiful. FOLLOWING THE INGREDIENT: Fresh and dried gemmerbos. How do you go about creating your fragrances? And how do you select the noses for your saint d’ici fragrances? I almost always start with an ingredient. My formula book has titles such as “Opoponax Absolute no. 11” or “Fever Tea no. 8”. I like to see how many different ways I can use a single ingredient and whether it works best centre front or in the chorus. I know that most perfumers start off with a story or fantasy, but I prefer to let the ingredients tell me where they’d like to go. HERBACEOUS: Clary sage, one of the ingredients used in Saint d’Ici fragrances. Saint d’Ici currently works with three other noses, all of whom I met whilst studying natural perfumery in Italy. I selected them because they are all talented and each bring a different aspect of natural perfumery to the table. Maurice Val nails unisex perfectly. Andrea Dittler brings vintage, old-world charm. Constance Beck-Treadway has the creativity to try radically new combinations together, with the ability to make them work. CREATIVE COMBINATIONS: Constance Beck-Treadway is one of the noses Marie Aoun works with. Do you have a fragrance hero/heroine? Not specifically. I am much more likely to be inspired by traditional cultures and their use of perfumery. The San’s use of buchu [a South African medicinal herb], the Sudanese matrimonial perfume ceremonies, even the Dogon’s love of the scent of fried onion are far more interesting to me than a fragrance master. They remind me of the instinctive response that we all have to raw and natural perfume ingredients. INSTINCTIVE RESPONSE: Marie Aoun takes her inspiration from natural ingredients. I am currently researching the various ways in which people fragrance their homes that are perhaps a little less obvious than scented candles and diffusers. I am look forwarding to doing more custom projects in the future. All the while I continue to work on new blends, to explore new ingredients and connect with various farmers and distillers across the continent. It’s intriguing to watch the evolution of a fragrance range from the launch of its pillar fragrance (Dunhill Icon) to the roll-out of its flankers (Dunhill Icon Absolute, Dunhill Icon Elite and Dunhill Icon Racing). It tells you something about the heritage of the brand and where it’s now re-staking its claim. ICONIC: The Dunhill Icon fragrance collection, from left to right, Dunhill Icon, Dunhill Icon Racing, Dunhill Icon Elite and Dunhill Icon Absolute. Dunhill has released many memorable fragrances since the launch of the superb Dunhill For Men in 1934. But the quality of releases over, say, the last two decades has been erratic, even for the most devoted fan. The launch of Dunhill Icon in 2014 was the esteemed British brand’s reclamation of all the iconic descriptors associated with its fragrances. “Quality”, “elegant”, “craftsmanship” and “British gentlemanliness”. CRAFTSMANSHIP: Dunhill Icon was launched in 2015. With the recent release of the latest addition to the Dunhill Icon range, Dunhill Icon Racing, I sniffed out all four fragrances. These are my impressions of each of the EDPs. RACING GREEN: Dunhill Icon Racing is inspired by the British brand’s motoring heritage. Launched in 2015, Dunhill Icon makes its debut with this complex scent created by master perfumer Carlos Benaim. It’s so much more than its aromatic-woody profile suggests. Notes of neroli, bergamot, cardamom, lavender, black pepper, leather and oakmoss feature in this effervescent EDP. This later 2015 release ventures into more opulent territory. It’s the Dunhill Icon take on the oud trend, while not going the whole shebang. This is a refined treatment of agarwood, with bergamot, black pepper, jasmine, saffron, black rose, leather and tobacco leaf notes adding to its appeal. An unapologetically woody fragrance, with ebony and sandalwood notes featuring prominently. There’s also a smattering of citrus, cardamom, black pepper and suede notes in this 2016 release. It’s smooth, seductive and modern, without being overly trendy. We’re talking Dunhill bespoke suit kind of stuff. Complete with stripes on the top of the bottle, Dunhill Icon Racing is inspired by Dunhill’s motoring heritage. To my nose, Dunhill Icon Racing is not as immediately impactful as its predecessors. Give it time, though, and this Laurent le Guernec composition make an impression with vetiver, lavender, cardamom, citrus and musk notes. I normally like my vetiver dark and dirty, but this fresher and younger interpretation is a winner too. My conclusion? This is not a range, but rather an evolving fragrance collection that warrants its higher-than-the-average perfume price. I must also mention the design of the Dunhill Icon bottle. The fragrance industry has no shortage of beautiful bottles to behold. But South African Mark Eisen’s award-winning cylindrical metal and glass design for the Dunhill Icon collection gets it right on so many levels. Paying homage to Dunhill’s motoring heritage, its solid and classic design is a sophisticated statement that Dunhill Icon is a collection with longevity. You can read more about fashion designer-turned-industrial designer Mark Eisen (picture below) here: http://fragroom.com/2017/09/15/south-african-beauty/. Dunhill Icon Racing EDP, R1 095 for 50ml and R1 595 for 100ml.